-- The partisan structure of the races for governorships and Senate seats are now exact mirror opposites. -- Sen. Angus King (I-ME) and Gov. Tom Wolf (D-PA) get ratings upgrades. -- Rep. Elizabeth Esty’s (D, CT-5) retirement gives Republicans an upset opportunity and is another example of how #MeToo is contributing to a high number of open House seats this cycle. With Mississippi now hosting two Senate races this year, 2018’s Senate and gubernatorial races have achieved something of a mirror-image symmetry. On the Senate front, Democrats are defending 26 seats (including two independents who caucus with Democrats from Maine and Vermont) while the Republicans, even with the addition of a special election in Mississippi, are still only defending nine. In the gubernatorial races, it is the Republicans defending 26 seats while the Democrats are defending just nine. There is one other governorship on the ballot not included here -- Alaska -- but an independent, Bill Walker, is seeking reelection. He defeated a Republican incumbent in 2014 and has a Democratic running mate, but Walker himself is not a Democrat, and because there isn’t a “caucus” of governors the way there is in the House and the Senate, Walker effectively doesn’t have to pick a party the way that independents in Congress do. This imbalance, which disadvantages Democrats in the Senate and Republicans in the gubernatorial races, could lead to an election where Democrats make significant gains in governorships but struggle to make up any net ground in the Senate, where Republicans hold a razor-thin 51-49 majority. In the Senate, Democrats do have some Republican targets. Both Arizona, an open seat, and Nevada, where Sen. Dean Heller (R) is seeking reelection, are 50-50 races. Heller benefited recently from President Donald Trump pushing perennial Republican candidate Danny Tarkanian to seek an open House seat. Tarkanian was previously challenging Heller for the Senate nomination and could have won. Additional contests in Mississippi, Tennessee, and Texas could provide Democrats with other pickup opportunities, though all are relative long shots. In the Volunteer State, Sen. Bob Corker’s (R) retirement has set up a likely battle between Rep. Marsha Blackburn (R, TN-7) and former Gov. Phil Bredesen (D) in the general. In the Lone Star State, Sen. Ted Cruz (R) faces Rep. Beto O’Rourke (D, TX-16), who just announced an impressive $6.7 million fundraising haul in the first quarter of 2018. Lastly, the resignation of Sen. Thad Cochran (R-MS) due to health problems has precipitated a special election this November that could become very interesting because of the candidates and the electoral format. Cochran’s appointed replacement is soon-to-be Sen. Cindy Hyde-Smith (R), and she will compete in a blanket primary on Election Day against candidates from both parties, with a runoff on Nov. 27 -- the Tuesday after Thanksgiving -- likely to follow. State Sen. Chris McDaniel (R), who nearly beat Cochran in a Senate primary runoff in 2014, is running against Hyde-Smith, as are at least two prominent Democrats: Mike Espy (D), a former congressman and U.S. agriculture secretary, and Tupelo Mayor Jason Shelton (D). The Crystal Ball rates the three races in Mississippi, Tennessee, and Texas as Likely Republican. Democrats, meanwhile, are defending four Toss-up races involving Sens. Bill Nelson (D-FL), Joe Donnelly (D-IN), Claire McCaskill (D-MO), and Heidi Heitkamp (D-ND). Nelson’s inclusion in the Toss-up category is predicated on Gov. Rick Scott (R-FL) challenging him, and Scott is widely expected to enter the race on Monday (April 9). The typical midterm trends that work in favor of the non-presidential party benefit all of these incumbents, but one or more could easily lose even in a bad environment for Republicans. McCaskill has appeared to be the most vulnerable Senate Democrat for much of the cycle, but likely Republican nominee Josh Hawley, the state attorney general, has had to deal with the fallout surrounding the indictment of Gov. Eric Greitens (R-MO) over accusations the governor tried to blackmail a mistress. It’s an ugly story from which Hawley can only keep so much distance because he’s the state’s top law enforcement official. To be clear though, McCaskill remains at best 50-50 to win. Donnelly awaits the winner of a three-way GOP primary that is as of now impossible to handicap, while Heitkamp will face Rep. Kevin Cramer (R, ND-AL). Despite polling from SurveyMonkey showing both Sens. Jon Tester (D-MT) and Joe Manchin (D-WV) lagging behind generic Republican opponents, we still perceive both as narrow favorites in states that aren’t quite as Republican as Trump’s landslide victories in each made them seem. The identities of their eventual general election opponents remain up in the air, and Republicans are worried that disgraced former coal baron Don Blankenship (R) might actually win the Mountain State’s GOP nomination over state Attorney General Patrick Morrisey (R) or Rep. Evan Jenkins (R, WV-3). Blankenship, the former CEO of Massey Energy, served prison time for conspiring to violate mine federal mining safety standards in connection with a mining disaster that killed 29 in 2010. Then again, Democrats who might prefer Manchin to face Blankenship should be careful what they wish for -- given West Virginia’s Republican turn and the state’s complicated relationship with its one-time signature industry (coal), we hesitate to completely rule out anything there. Many Republicans seem to regard Sen. Tammy Baldwin (D-WI) as one of the party’s top Senate targets, more appealing even than Tester or Manchin according to some even though Wisconsin is a 50-50 state politically. Immense outside spending by conservative groups confirms the chatter. That said, we still see Baldwin as a favorite. For one thing, it’s not clear that whichever Republican emerges from an August primary will be a top-tier candidate. Any of Marine veteran Kevin Nicholson (R), state Sen. Leah Vukmir (R), or businessman Eric Hovde (R), the 2012 GOP Senate primary runner-up who is still mulling a run, could give Baldwin a real race, but all three are unproven at the statewide level. Also, Wisconsin Republicans have been blindsided by two lopsided recent losses: The party lost a state Senate special election in a red district in January and a technically nonpartisan statewide Supreme Court race on Tuesday, both by double digits. Those results are not necessarily predictive of the future, but one also would not look at those results and conclude they suggest the state’s incumbent Democratic senator is unusually threatened -- remember, non-presidential party Senate incumbents have an excellent record of winning reelection in midterm years. Incumbent Gov. Scott Walker (R), who is seeking a third term, took to Twitter to sound the alarm bell after both losses. Baldwin and Walker are almost exact opposites politically, and in a polarized state there may not be many ticket-splitters. We have both incumbents in the leans category, but given the likely Democratic lean of the midterm environment, Walker may be in more trouble than Baldwin. But Walker, like Baldwin, benefits from an unproven field of candidates from the opposing party. Elsewhere, some recent polling has shown Sen. Sherrod Brown (D-OH) leading, although he must be on guard in a state that seems to be trending to Republicans. Other Democrats not mentioned here are in better shape, as shown by our ratings in Map 1. On the gubernatorial front, Democrats seem better than 50-50 to win Republican-held seats in Illinois, Maine, and New Mexico. The GOP’s best targets are Alaska, where independent Bill Walker is unpopular, and open seats Democrats are defending in Colorado, Connecticut, and Minnesota, particularly if and when former Gov. Tim Pawlenty (R) decides to try for a third, nonconsecutive term in the Gopher State (he appears likely to run). Democrats have several other prime targets, which is natural given both the environment and the immense amount of defense Republicans need to play on this map. We’ve previously said that the best way to judge 2018’s gubernatorial races is by which party wins a majority of five big states: Florida, Illinois, Michigan, Ohio, and Pennsylvania. Republicans currently hold all but Pennsylvania. Gov. Bruce Rauner (R) is an underdog against Democratic nominee J.B. Pritzker in Illinois. Florida and Michigan are open-seat Toss-ups, and Ohio Leans Republican but should feature a competitive race in the fall. Meanwhile, Gov. Tom Wolf (D-PA) seems like an increasingly good bet for reelection, as we explain in our next section. With the expiration of candidate filing deadlines for statewide races in Maine (March 15) and Pennsylvania (March 6), we now know what the candidate fields look like in the senatorial and gubernatorial contests in those states. 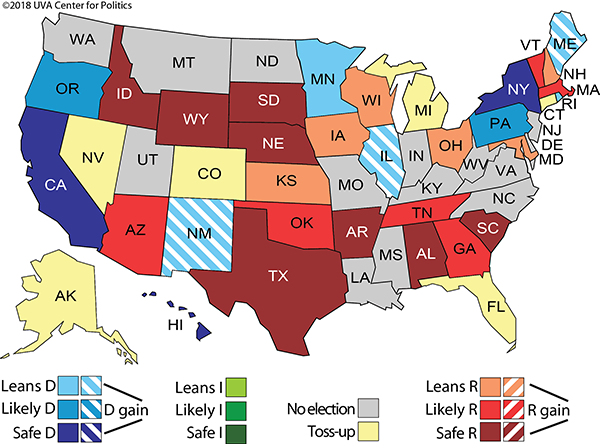 Given the developments in the U.S. Senate race in Maine and the gubernatorial election in Pennsylvania, the Crystal Ball is shifting the ratings in each of these contests in the Democrats’ direction, to the benefit of Sen. Angus King (I-ME) -- he caucuses with Senate Democrats -- and Gov. Tom Wolf (D-PA). 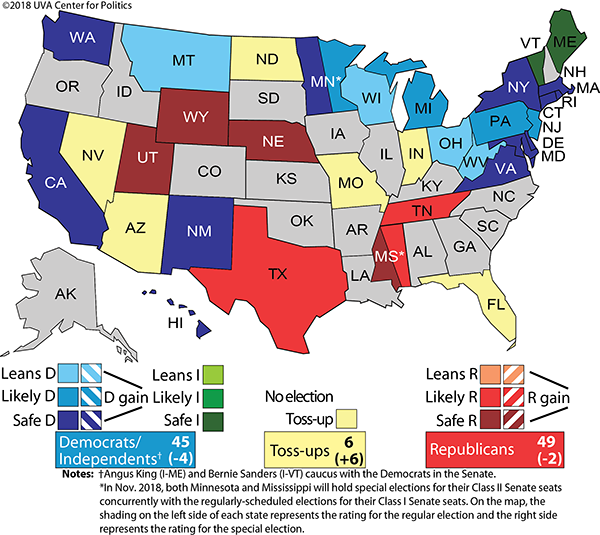 The Maine Senate race moves from Likely Independent/Democratic to Safe Independent/Democratic and the Pennsylvania gubernatorial race moves from Leans Democratic to Likely Democratic. In the Pine Tree State’s Senate contest, the political future of the LePages -- Gov. Paul LePage (R-ME) and his wife, Ann -- had been the major question mark at the start of the 2018 cycle. As a twice-elected statewide official popular with the GOP base, Republicans viewed Gov. LePage as their best bet to make the race against King competitive, though LePage’s wife also earned mention as a possible candidate. In May 2017, Gov. LePage’s top political consultant announced that the governor would not seek the Senate seat. With one LePage out, then-White House chief strategist Steve Bannon reportedly turned to Ann LePage, hoping that she would throw her hat into the race. Meanwhile, it seemed that Gov. LePage had not completely ruled out a Senate bid, and in December 2017 it came out that President Donald Trump was pushing Gov. LePage to reconsider his earlier decision. Ultimately, though, the GOP got neither LePage. Instead, the Republican field consists of Libertarian-minded state Sen. Eric Brakey and financial planner Max Linn. As of Dec. 31, 2017, Brakey had just $85,000 cash-on-hand, and there was no info for Linn. Meanwhile, the incumbent King had about $2 million in his campaign war chest. A potential problem for King would have been a serious Democratic contender, who might have threatened Democratic backing for the ostensibly independent incumbent. However, the lone Democrat in the race is Zak Ringelstein, whose campaign only had about $62,000 in the bank at the end of 2017. Ringelstein has an interesting profile -- he was named to Forbes’ 30 Under 30 for education in 2015 -- but he does not appear to have the resources to seriously threaten King. Moreover, it seems that the incumbent is quite popular, which may have discouraged the LePages from running: According to Morning Consult’s most recent data on approval and disapproval, King ranked as the ninth-best senator in approval, with 59% of Mainers approving of his performance. Given these various data points and the lack of a first-tier Republican challenger to King, a Safe Independent/Democratic rating is appropriate. In the Keystone State, Gov. Wolf had appeared to be potentially vulnerable. About one year into his governorship (February 2016), the Franklin & Marshall College Poll found that only 31% of Pennsylvanians thought Wolf was doing an excellent or good job. Since then, however, his numbers have improved, and the most recent poll from late March found 43% of respondents believed Wolf was doing an excellent or good job. Morning Consult’s most recent data showed Wolf with a net positive approval rating (+6). While Wolf’s numbers are not notably strong, they are not notably weak, either. In what is shaping up to be a favorable electoral environment for Democrats, one could reasonably argue that Wolf only needs to be in decent standing with the electorate to have a solid chance at reelection. As for the GOP, Republicans had hoped that a first-tier candidate like Rep. Mike Kelly (R, PA-16) would enter the race to challenge Wolf. However, Kelly opted against a gubernatorial run. With filings finalized, the two main Republican contenders are state Sen. Scott Wagner and businessman Paul Mango. Wagner is probably the frontrunner, though there has been only limited polling. Both Republicans are throwing millions of dollars into the race: Together, they spent $5.4 million in the first quarter of 2018, and in terms of cash on hand, Wagner had $6.2 million and Mango $3.3 million as of March 26. However, a lot of the GOP spending has been on primary attack ads defining the opposition as insufficiently conservative. For example, Mango recently attacked Wagner on abortion, while Wagner claims Mango was a proponent of Obamacare. As the temperature of the Republican primary rises, Wolf just announced that he ended the first quarter of 2018 with $14.7 million cash-on-hand, and he has no opponent in the May 15 primary. Moreover, should Wolf feel threatened by his eventual opponent’s war chest, he could dip into his own pocket. After all, Wolf spent about $10 million out of his own bank account in his victorious 2014 campaign. In light of Wolf’s stronger position, we now rate the Pennsylvania gubernatorial contest as Likely Democratic. He joins Sen. Bob Casey (D-PA) in that rating category. Rep. Elizabeth Esty (D, CT-5) announced her retirement earlier this week after stories emerged of how she kept a former chief of staff around for months after a former aide had accused him of punching her, in addition to repeated harassment. Esty signed a nondisclosure agreement to protect the man’s reputation and even vouched for him as he got a new job. Esty’s retirement brings the total of open House seats in November to 57, adding one more name to an increasingly long list of departing House members (we assessed the other 56 open seats in depth last week). After the Esty story broke last week, we changed our rating of her district from Safe Democratic to Likely Democratic. We’re keeping that rating now that the seat is open, and we may downgrade Democratic chances further depending on how the race develops. Hillary Clinton won the seat by four points in 2016, and it probably will vote Republican in the state’s gubernatorial race this fall. If Clinton were in the White House, this would be a Toss-up, but the usual presidential party midterm drag works against Republicans here. Still, Republicans now have another open seat target. Esty is just the latest of about a half-dozen members who have seen their careers ended by sexual harassment, either through direct allegations or through not addressing complaints against others more seriously. In a year with an already-large amount of turnover, Capitol Hill’s -- and the nation’s -- reckoning with poor behavior is contributing to the exodus. And here’s the thing: We should probably expect the careers of more members to end this year because of what’s become known as #MeToo, the flood of credible allegations of bad behavior by people in power (mostly men) toward subordinates (mostly women). In what could be a very close national battle for the House, the openings forced by these sexual harassment allegations may play a role in determining the next majority. The continuing fallout from #MeToo is what former Secretary of Defense Donald Rumsfeld might call a “known unknown” -- we know that future retirements prompted by these kinds of allegations might affect more House races this year, but which ones, and how many, are unknown. 1. As a part of its redistricting order, the Pennsylvania Supreme Court shifted the candidate filing deadline for Pennsylvania’s congressional districts to March 20, but the March 6 deadline for all other Pennsylvania offices remained the same. 2. Kelly’s current district under Pennsylvania’s old congressional map is PA-3, but he is running in the newly-drawn PA-16. The federal budget deficit was $598 billion for the first half of fiscal year 2018, CBO estimates, $71 billion more than the shortfall recorded during the same period last year.